A touch of orange color in the room always brings freshness and warmth schemes. Orange color is able to bring enthusiasm and excitement. However, to get perfect orange kitchen style, you don’t have to paint the kitchen” href=”https://homestrendy.com/kitchen-set-for-nice-kitchen”>entire kitchen room with orange color only. As an accent is enough to bring fresh and warm atmosphere in the room. You also can coloring some small kitchen appliances such as knives, spoons, bowls, or showing orange photo frame to get luxury atmosphere in the kitchen. The bright color is capable to exposing the hidden expressions on your kitchen. Not only that, the orange is also believed to increase appetite if your kitchen also serves as a dining room. The orange color is often combined with white and black. Combination of white and orange will give smooth, cool and fresh schemes for every people who stay there. It is suitable for small and minimalist kitchen landscape. While combination of black and orange will provide you dim display but impressive luxury, very fitting for decor in classic style kitchen, modern or French country style kitchen. 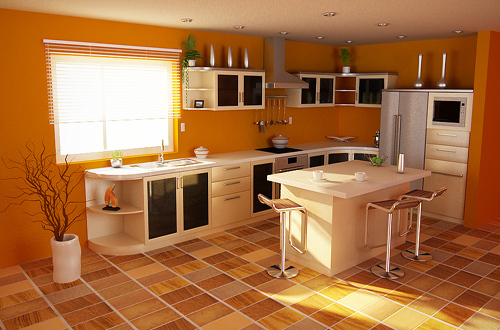 And now you take a little time to see collection of the best orange kitchens decor from world class designers.